Once registered you can view our price card or process your data for audit to obtain an accurate quotation which will be emailed to you. Having processed your Data Quality Report, go to 'download cleansed data' and select the services you require. Once you get to the final summary screen scroll down and click the 'email quotation' button. Yes, credit card facilities will need to be activated please speak with your account manager on 0151 355 4555 who can do this for you. Do you provide international cleansing? We provide international address cleansing services through our bureau services team. How many Data Quality Reports can I process? How many audits can I process? There is no limit to the amount of audits you can process proving it falls within our fair usage policy. Yes, currently it is £25 plus VAT for online services. For bureau services the minimum order value is £150 plus VAT and Data supply is £275 plus VAT. Do you provide consumer email addresses? Do you provide consumer emails? We can provide the service of consumer email append but this is done through a managed broadcast with opt in and is fulfilled by our bureau services team. Why have the leading zeros on my telephone numbers disappeared? If you purchase some data from us that contains a telephone number column, you may find that it doesn't display correctly in Excel. For example, our phone number 0151 355 4555 may show as 1513554555 or even 1.51E+09. Not very helpful. This is because Excel is treating the field as a number rather than text. The file will actually contain the correct number, e.g. "01513554555", but when Excel opens the file it decides to display it in the same way it displays other numeric fields. When the filename has a ".csv" extension, Excel will always convert telephone numbers to numeric values and display them in the formats shown above. The first thing to do then is to rename the file to give it a ".txt" extension instead. In Excel, click File > Open and select the .txt file. Click Open and the Text Import Wizard will open. 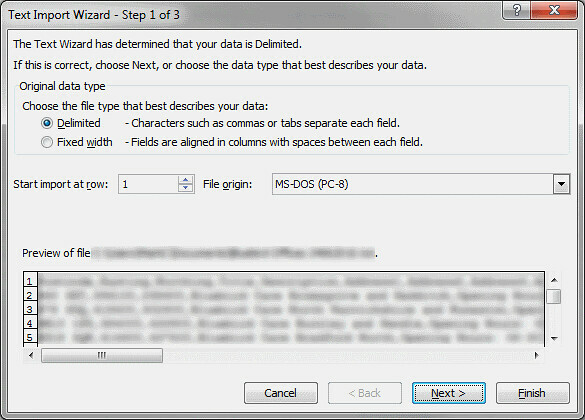 On the first screen of this wizard, select the Delimited data type option and click Next. On the second screen of the wizard, select the Comma delimiter option. 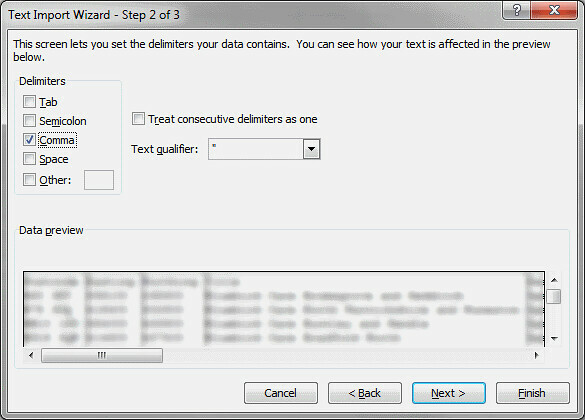 Ensure that all the other delimiter options are unticked, as is the "Treat consecutive delimiters as one" option. The "Text qualifier" option should be left as a double-quote. 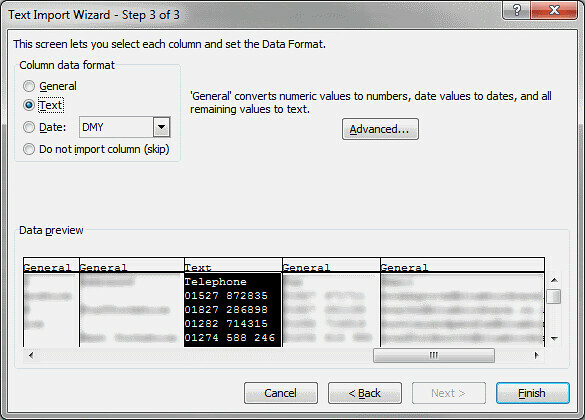 Select the telephone number column, then click the Text data type option. Repeat this for any additional telephone number columns you have. Click Finish and your file will be opened correctly. What is the difference between flagging and suppression? Suppressing data removes all records identified as a goneaway or a mover from your data. Whereas flagging will not remove the data and update record with flag; for example if we identify the record as a goneaway we will mark it as “GA”. Suppress is usually used from one-off mail shots to reduce the cost of your mailing. It is the most cost effective way to remove the records but is only a one off and does not allow you to understand your data better. As best practice we suggest Flagging. Flagging allows you to use the results again and again, and increase your return on investment. Many customers create a goneaway file that they can periodically check against our movers service to update information and re-engage with lost customers. What do you do with my data once I have submitted it online? If you purchase data it is stored for 90 days before deletion from our servers. How much is consumer data? How accurate is your consumer data? Although data can never be 100% accurate we do try to ensure we supply the best quality that we can, we screen the data on the day of supply for TPS/CTPS/MPS, and live line testing telephone numbers to ensure they are callable. What format does the data come in? We supply data in CSV and output cleansed data in CSV unless requested otherwise. How long does it take to supply the data? Data is supplied within 48 hours of receiving the signed order form. How do I submit a file for cleansing? How do I submit a file for processing? Sign in and go to 'Account Management' click the 'Add New User' tab and complete the details. Below are some common questions and answers to our data validation services. I can't remember my password, how can I reset it? Yes, we offer a free 30 day trial of all our services. I only have one field for telephone on my web form, how can I validate both landline and mobile numbers? How much is Address Validation (Postcode Lookup)? Do you offer International Address Validation? Do you offer a reseller scheme? How do we monitor our usage? You can monitor your usage via the secure client admin area and even set up email alerts to notify you when you're running out. For new customers you must firstly register for an account, for existing customers you can monitor your usage from your Dashboard. What is Data8's ordering process? Can we top-up our services automatically? Yes, this facility can be set up within the admin area to either invoice or bill a credit or debit card. If you are a new customer you can Click here to register for an account. For existing customers you can top up your services by clicking on your Dashboard. Our standard payment terms are 14 days from date of invoice. Can we integrate your services in to our system? What are your uptime stats? We offer a variety of flexible payment options, including monthly invoicing please ring 0151 355 4555 for further information. Can you validate multiple touchpoints? Thanks to our technical expertise, we have a wide variety of web services to validate all contact details. Even bespoke projects. Where do I create my Ajax key? This can be done by going to the following link. Why should I choose Data8 for my data supply? Our focus is to provide timely business and consumer information that is trusted by our clients. We are continually developing our service, always looking for ways to add value for our clients, to ensure they all benefit from an increased ROI. What types of business are included in your B2B data? Our New Business Data contains leads for a variety of businesses i.e. those that recently set up. As well as new business start-ups, you can also receive details of businesses that are changing ownership, relocating or opening new branches. Our existing business data covers a range of limited and non-limited companies. Each of these sectors produces an opportunity for a company to exploit. How do you obtain your data? Our data comes from a variety of national database sources, this is then verified by our research centre and additional information is added. This ensures you get regular data you can trust. All contact data is validated before it is supplied. Your data will be sent as an email attachment that can be easily opened in most office packages, including Microsoft Word or Excel. This means you can either integrate the leads straight into your existing database or run a mail merge directly from the data. We can also supply data in the form of mailing labels, printed lists or on a disk. You can pay by credit card, paypal or, we may at our discretion choose to offer credit terms. There is a minimum order of £50 per data file. What is Foundation Technology and how can it work for my business? Can you tailor make a solution for my business? Yes, we deploy many tailor made solutions for businesses of all different sizes. Our technical team would be happy to discuss your requirements contact them on 0151 355 4555. How much do your Data Quality solutions cost? We need to match your exact requirements, so its probably best to arrange to speak to one of our technical team for more information and for an idea on pricing. Contact us on 0151 355 4555.